I've had a freebee version of the "Rules with no name" on my hard drive for some time now. This is the short 27page PDF from when the rules were available for free download, before Foundry bought the rules and made an over the top expensive 130+ pages rulebook out of it. From what I've read the rules are basically the same though, the book has more explanatory charts and such, pictures, full color etc. But let's forget about that and just focus on the raw rules for this game. This game I think is set more towards participation games with more than two players taking part in the gunfights - rather than a 1vs1 player gameplay like in Legends of the Old West. Not that you could not play this game 1vs1 but it feels more open ended which explains some of the design choices such as random activation of models by using character cards drawn from a deck. Another thing that makes this game lean towards having more players involved is that it is a lot more detailed when it comes to wounding characters, actually killing someone is a feat as there are but a couple of "killed" results, but a lot of grazes, flesh wounds and serious wounds on the wound chart. Which of course makes the game go on for a longer period with characters limping about with wounds to their legs or arms, reducing their accuracy and movement rate etc. The tradeoff is that you will need to have lots of cards and charts at hand to resolve most of the action. First of all, you need a "character card" for each model on the board taking part in the skirmish. 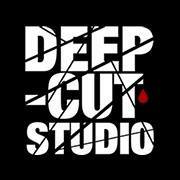 This should be a portrait of the miniature itself, you also need 1 Joker card and 1 card for each of the "character classes" in the game (Citizen, Gunman, Shootist, Legend). These are used to determine which model takes its turn to perform all allowed actions. You go through the deck until you hit the Joker at which point the cards are shuffled back together and you start from the beginning again. The "character class" cards provide a special bonus allowing players to sometimes activate additional models at the same time. Models activated are allowed 1 single action. The range of actions available include, moving at full speed, moving and shooting, reloading, clearing jammed guns, recover from being shot, get up from the ground and a few others. But you have a wide selection to chose from. Movement is a bit weird, since you roll 3D6 and move a model in a straight line up to the distance rolled. Not really a fan of this particular feature, but I guess it fits in with the rest of the game mechanics. 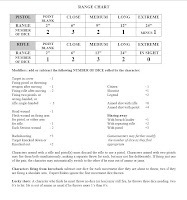 Character activated is a "Shootist", this profile alone give you +1D6 during your shooting phase. You did not move the model so there is no penalty. You are armed with a pistol and you decide to fire at close range (6") which gives you 3D6. Enemy is in cover which adds a -1D6 penalty. You decide to fire "Deliberate fire" which can only inflict 1 wound no matter how many 6's you roll but you can never jam or run out of ammo this way. +1 for the shootist, +3 for close range with pistol, -1 for enemy in cover = 3D6 roll to hit. You roll 3, 6, 6 which means you hit your target, but can only use one hit to wound since you used "Deliberate fire" mode. You then roll on the wound chart, which is a 6x6 window chart of wound results which randomly determines what body part was hit and what kind of damage was done to the enemy. This chart ranges from flesh wounds, to specific body damage that cripples or outright kills the enemy model. You can substitute the 2D6 wound chart by printing out the 36 wound cards instead to speed up the process of determining the outcome of your hits. Doc Holliday being a Legend shoots 5 dice at close range and does so with the Blazing away action meaning each 6 will become a wound. He rolls and scores 3 hits, no jammed or out of ammo results. The target gets pretty roughed up having to roll 3 wound results on the chart! 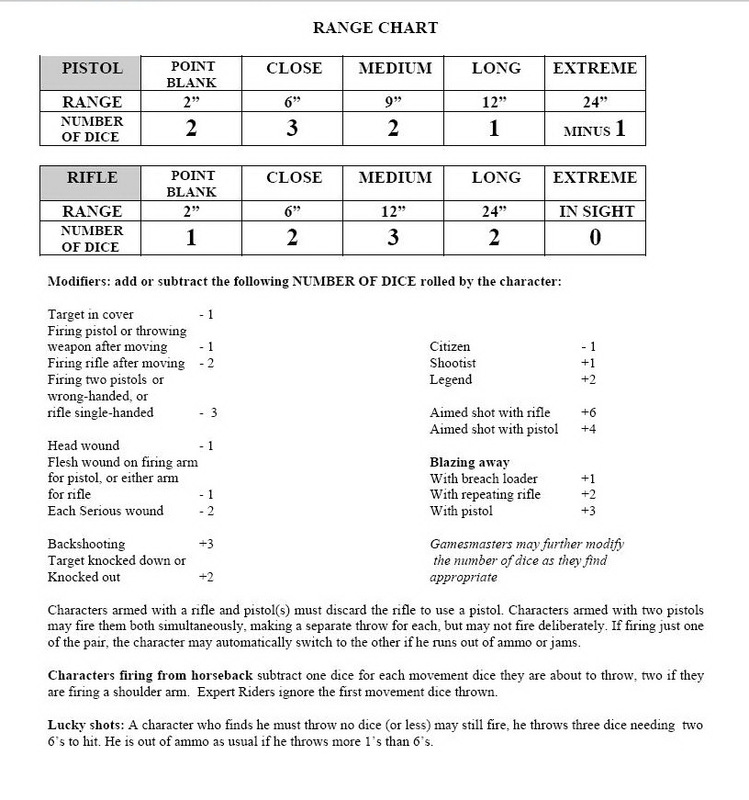 The core rules are just 8 pages long and provide for some interesting and dynamic gunfights. There are a substantial amount of additional rules however, which includes close combat which is equally detailed in how to hit/deal damage and random in actual wound outcome. There are also a ton of skills that you gunslingers may gain after they survive a game which adds to the character of each model in a good or a bad way. There are rules for Indians, horses, challenges and duels, despicable acts such as shooting someone in the back, rules for hatred/fear/nerve, and pretty much every other aspect of a Old West situation that you can think of. The rules are very detailed with lots of charts, but you can greatly reduce the time spent consulting these if you use the markers instead. True it takes some time and effort to actually make these, but it could be worth it when playing in a group. The game also clearly aims towards having a "gamemaster" who controls the bystanders in the town where you are raising hell. Now I can't compare Legends of the Old West to Rules with No Name in the printed version. I can only assume that the printed version of these rules have character profiles just like in Legends of the Old West. But comparing the backbone of the rules I think both games have their strengths and weaknesses. Now don't take the amount of +/- to be some sort of a score, but rather what I think of certain aspects of both games. Some are minor others are of greater impact. It would seem as the free version is not available anymore though, having conducted a quick google search. But if the above picked your interest I can recommend giving "Rules with no name" a try. You can still find the rules for download here: http://www.mts.net/~gisby/owrule.htm plus I think they are in the RWNN yahoo group also. I've not really tried any old west rules, although I find myself leaning towards LOTOW. I may have to pull this PDF up and give it a try also after we start LOTOW. I started to paint up some of my figures that I ordered from Knuckleduster (ordered about 60). I have about 18 or so done so far. Once this batch is painted, I plan to order up a few extra to round out the collection. My goal is to have about 100 models so I can loan out posses to players to play. I posted a few pics up on my blog "Dice at High Noon".